In our little family, everybody gets at least one book for Christmas. Sure, books don't make the flashiest of gifts. In fact, my kids are likely to smile and toss their books aside in favour of dolls, electronic toys and games. When the initial excitement wears off and the batteries run out though, the kids will be reaching for those books. Then we can enjoy them together, parent and child, sharing in incredible stories and amazing facts. My daughter has been asking for DK's "Cookbook for Girls" for a while now. It looks like the perfect cookbook to bring joyful cooking experiences to a young child. 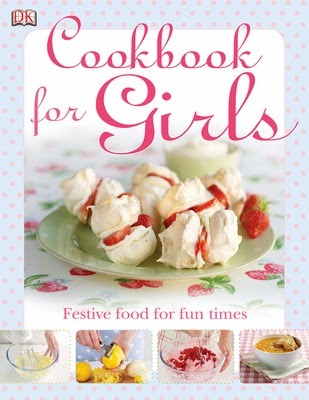 In fact, "festive food for fun times" is the theme of this pretty book. "Cookbook for Girls" includes more than 50 dishes for serving at parties, making with friends (and Mom!) and learning kitchen skills. I am looking forward to making vegetable tempura and cherry cordial! 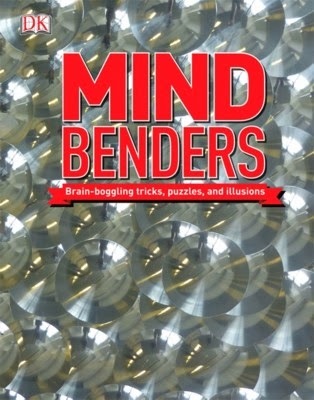 My son will be getting "Mind Benders" this Christmas. 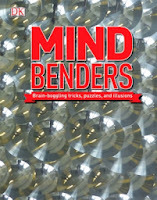 This book promises to "flex your mental muscles" with interactive brainteasers, optical illusions, word and number games, logic puzzles, physical tricks, mazes and more. With bright, attractive images accompanying 60 mind bending questions and challenges, this book is sure to divert my son's attention from Minecraft for a bit! There's even a pop-up page and an envelope full of shapes used to solve various puzzles. The book also explains how each challenge works and how to find the solution. The kids will also be receiving "It Can't Be True!," a collection of impressive facts about the world that are difficult to believe, but true. The moon is the same size as Australia. A blue whale's heart is as large as a car. 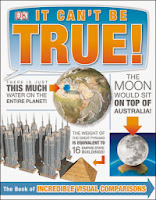 Parents and children alike will be amazed by these strange facts! Topics include the human body, buildings and outer space. This one is great for the curious child - and what child isn't? The photographic imagery and CGI ensure that learning is fun and engaging. To celebrate the publication of the "LEGO Play Book," DK Canada challenged the other DK offices around the world to a LEGO "10 Minute Handful of Bricks Challenge." The creations of nine DK offices are now online here. Inspired by the Handful of Bricks Challenge that appears throughout the "LEGO Play Book," the challenge shows that you don’t need a ton of LEGO to have fun. DK Canada is asking you to vote for your favourite creation between now and December 1st. Better yet, send along a picture of what you can build in 10 minutes. Canada is currently trailing - badly - so give our friends at DK Canada a boost! Follow along on Twitter using the hashtag #LEGOPlay. *I received product for review purposes. Thank you for supporting the awesome companies that partner with Woman in Real Life! I love to buy books especially for kids! These are great suggestions. Thanks for sharing. Going to share the lego clip with my son, he will love it.